I’ve become a bit of a salad-a-holic lately. As in, if I had friends I actually saw on a regular basis and they knew how many leafy greens I was ingesting, I’m sure someone would stage an intervention. Fortunately, I don’t have a social life and with only like, two friends who I see maybe once or twice a year, my vices are allowed to run amuck unchecked. This explains why my skin may be turning green shortly. Today, I am showing you the salad I eat two or three (or four or five) times a week. Sometimes it is lunch, sometimes it is supper, sometimes it is a snack, and I’m not gonna lie, sometimes it is breakfast. I don’t hold myself to mealtime boundaries when it comes to food choices. This drives one of those two friends crazy. She has a firmly held belief that breakfast food should be ingested at breakfast time so I take great delight in calling her at 5:00 am while I am eating things like greek salad or a bowl of sweet and sassy pickles. It’s how I get my kicks and hey, we gotta get ’em however we can somedays! Rather than do a full tutorial, I just did a few pics because me throwing things in a bowl together is about as exciting as it sounds. Of course, you can use whatever ingredients you like but I keep mine simple. I prefer dark greens and most of the time I just use spinach for the salad base. I add cucumbers, sliced red onions, feta cheese, and fresh basil. On the cheese, I find that it is usually cheaper to buy a block of it and crumble it myself. It crumbles easy so I just hold it over my salad and break it up with my hands. For you, just for you, because I love you sooooo much, I am using a tomato in today’s salad. I don’t normally add tomato because I love them every way in the world except for raw. But I know most of y’all like them raw (no judgement here, we’re all weird in different ways, right?) and I wanted you to be able to fully visualize this salad as you would eat it. Plus, I’m slicing them in big enough wedges that I can fish out later so it’s a win for both of us. To make this salad quick and easy during the week, on the weekend I chop everything up and put all of the ingredients in separate containers in my fridge so I can throw this together in a flash. To store my lettuce for the week, I put it in a large zipper seal plastic bag along with a paper towel. This absorbs excess moisture and keeps your lettuce fresh at least two or three times longer than normal. To make the salad, I tear up the basil leaves and mix them with my greens, then I toss it together with all of my vegetables. I have experimented with all sorts of dressings and I find the best for my taste is simply Balsamic Vinaigrette. Isn’t that a gorgeous salad? What is your go to salad? I’d love to hear about it in the comments – You might inspire me to try something new! Tear basil leaves and add to greens along with all other veggies. Toss to combine. 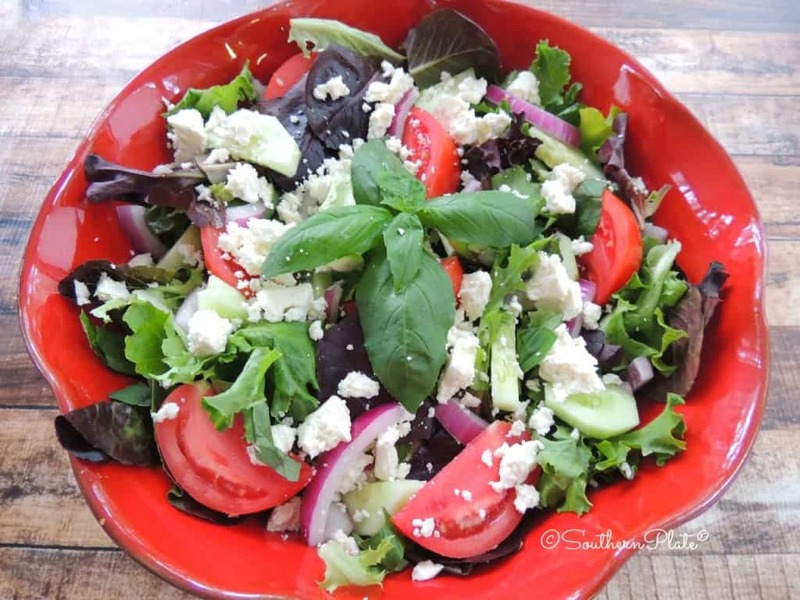 Sprinkle Feta cheese over top and drizzle with vinaigrette. Submitted by Janet Taylor. Click here to submit your own. I have a new series on SouthernPlate called Lifesavers. These are little daily devotionals I write and usually share on Facebook but I decided to start sharing them here from time to time as well. To read today’s please click here. Mmmmmm…..this salad looks wonderful! Can’t wait to try it! I love Greek salad, but my go-to salad is this: mixed greens or romaine with cherry tomatoes and (thawed) frozen peas. Top that off with a creamy dressing of any kind and I’m happy! LOL. I love raw tomatoes and ate them as a snack as a child. I love your salad. I like to add dry cherries or cranberries, pecans, black olives, and love blue cheese dressing. I’m making some tonight! Thank you for posting it. Love your photos! Since my husband is diabetic (controls it with diet and exercise! ), we have a salad most every night. Green salads, coleslaw and three (or more) bean salads are my go to salads. I really like the fact that coleslaw and been salads get better as they sit in the frig and I can get up to four nights worth of salads in one making!!! He hates tomatoes raw (or cooked if he can “see” the tomato), so I rarely have tomatoes and when I grow them, I make tomato sauce with them. You should try a Greek vinaigrette dressing just once. Delicious !! From on Southern gal to the next, I’m soooo happy to see another wierd southerner ( at least that is the look I get here in NC when I say I detest raw “maters”). I love ketchup, tomatoes cooked in soups, stewed, pasta dishes…but I just can’t eat them raw. I love your website and your receipes. I made your taco casserole just this week and it was beyond what I expected. Keep up the GREAT work! That looks so good. I’m going to try it as soon as I can get to the grocery store! 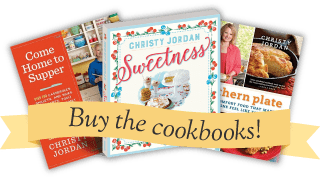 Love your recipes and your stories! Keep it coming. i like to make “deconstructed” caprese salad. I take cherry tomatoes, usually the cherubs you can get in a little tub and cut them in half. I have heard that if you sandwich them between two plastic lids and saw them in half that way, it’s a snap. I am fearful of having to round those little suckers up from off the floor. Will try when I am feeling audacious. next, i get one of those packs of mozzarella pearls that I find at Walmart, break them up into…well, pearls, and add to the maters. I dump in about half a glug of olive oil, then a handful of torn up fresh basil. Yep, that’s a lot! Sometimes I use more. Occasionally i will add some balsamic vinegar. I put a good couple shakes of garlic salt, ( I know. non-traditional. I’m a rebel like that) and stir gently. Stick in the fridge for a half hour or so, just to set the flavors. Does not keep well so it should be eaten the same day. I make salad like this, but mine would be about half tomatoes when my garden is producing. I prefer Vidalia or green onions instead of red onions. I, too, use purchased dressing. I buy Ken’s Lite Balsamic Vinaigrette when it is on sale, and then I add more balsamic vinegar. I do like my vinegar! I love salads with whatever fruit is fresh (or fresh-ish) at the time. I like to have something Sweet, something Salty, something Sour and something Bitter (greens sometimes are) and something kinda meaty (umami). I like pieces of bacon or goat cheese or chunks of chicken for the meaty (umami) taste. To give interesting creaminess, I LOVE an avocado cut into chunks- really plays well off the goat or feta cheese and pecans. I add whatever veggies I have- cukes, maters, peppers, finely chopped cauliflower. A salad like this is addictive for me. It’s as good with plums as it is with berries- any softer fruit makes a great vinaigrette. On another note, as we are all continuing to look for ways to save money, it’s really EASY to grow salad greens. Honestly, mine do better in containers with potting mix than they do in my actual garden. Most greens like cooler weather over hotter, but as long as they get water and you keep them picked, (if you cut them with a scissors during cooler seasons they will grow back again) you can enjoy your own really cheap, incredibly yummy salad greens. There are a few kinds of greens that really love and thrive in HOT weather. Malabar spinach is a heat loving CLIMBING spinach. SO good!!! It vines so it needs something to grow on and it’s doing well in my garden. It puts out side vines continually so once it’s established there’s always yummy spinach to be picked and ready to eat. He picks his fresh in the morning for his sandwich- can’t get much fresher than that, can we? There is a New Zealand spinach as well, (we can’t get that in our farm markets) and purslane (a domesticated relative of the common edible “weed” many of us have growing in our garden or yard) are a few others. I can’t wait to read your Lifesavers, Christy! Hi Christy, I love Greek Salad as well. I’m eating one right now! I like to use spinach, romaine or spring mix. I put in tomatoes (love those things) pepperoncini peppers, red onions, calamata olives, feta cheese and I use greek salad dressing. Thanks for your salad recipe. The salad looks delicious. If you are ever out and about from home you might try Wendy’s strawberry chicken salad. You can get it as a half-salad also and it has a wonderful dressing. I know it is nothing like yours with all the love you put in it but it is just an idea in a pinch. Thanks for sharing your recipes. I love the way this looks! I can’t wait to make this! That’s a nice Greek salad, my Greek grandparents and mother would also add pitted Kalamata olives and a dusting of oregano. They would sometimes sub lemon juice for the vinegar in the dressing which was always olive oil and vinegar with garlic….and there was ALWAYS a salad at dinnertime. Thanks for bringing back some memories. I take a mix of greens (no iceberg) and then add a thinly sliced red onion, tiny bell peppers sliced, cucumbers, cherry tomatoes, and sometimes fresh yellow squash thinly sliced. I add blue cheese crumbles, dried cranberries, piece pieces, and whatever else sounds good at the time. I make my dressing that has been a crowd favorite for years. One bottle of Old Dutch Sweet and Sour dressing, 1 package of dried italian salad dressing mix, a tad of white vinegar and a tad of water then mix it up and pour on the salad and toss it all up. Delicious. I make it for every family gathering, party, holiday, etc. I, too, have been binge eating Greek salads! 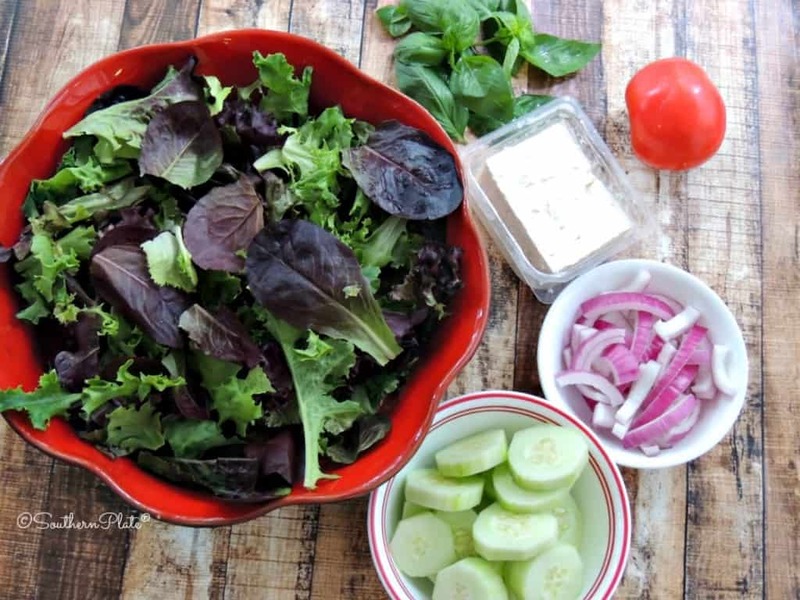 Add peperoncini, olives, croutons, and Greek dressing for the best salad! Classic variation about Mediterranean cuisine. Fresh vegetables, a little bit protein from Feta and fat from vinaigrette. Perfection! Add a few olives and it’s perfect. The salad looks Wonderful! I LOVE salads, too and I would so eat this. Breakfast for lunch or supper, and….salads for breakfast……fine with me! 🙂 My friend Jyl would about die to hear us talking this way Angela!! my salad at this time all comes from my garden except for the cheese, bacon, and dressing. I use black seed simpson leaf lettuce, small crisp straight 8 cucumbers, yellow pear tomatoes, small purple onions with the green tops cut up too, fresh cut basil, fresh cilantro, then cacique a Mexican cheese that crumbles like feta but less expensive, a strip of crisp crumbled bacon and a sweet sour dressing I make by boiling 1 cup sugar, 1 cup vinegar, and 1 cup of canola oil along with 2 tablespoons of poppy seeds salt and pepper to taste, until the sugar is well dissolved then I cool it off and keep it in the fridge in a mason jar just shake it up when needed and drizzle a little over my salad. It doesn’t take much of this dressing to flavor a salad. YUMMY!!! Oh YUMMMM is right!! Thanks for sharing Marsha!! I love iceberg lettuce. I know it’s not cool, but some of those leaf lettuces just hit my mouth like razor blades. So…chopped up iceberg lettuce, topped with diced cucumber, chopped celery and LOTS of shredded carrots. Then add diced cheddar cheese. I wouldn’t holler if you added some pecans, and I’ll kiss ya if you throw some Mandarin oranges on top. Pour lite Catalina dressing on top….yuuuuuuuuummmmmmmm. Yum indeed!!! No judgement here on what kind of lettuce you like Catherine!! Whatever cranks your tractor is my motto!! Y’all are very motivating! Is it too late to plant a garden in Colorado ? What types of tomato and lettuce ? I have rosemary,thyme,oregano and basil. I bet you could still plant a few things Vickie!! My super easy Go To Salad I eat bout everyday is simply chopped Romaine lettuce, English cukes, * hate those big seeds, feta cheese, green onions, a diced half of a yellow or red pepper if I have one around a handful of croutons. ..and the BEST PART….THE DRESSING….N SUPER EASY TOO. IN A LIL JAR WITH A LID I MIX …..Equal parts e.v.o.o and apple cider vinegar…a dask of garlic powder and pinch of kosher salt n fresh ground pepper …now here’s the part that gives the Bang to the dressing…. big ol’ pinch of Italian seasoning. …..now shake that jar like a Polaroid picture & pour that over that fresh salad and eat like a ravenous rabbit in garden patch 🙂 btw.mlove ya Christy n God Bless. Hi, being of Italian decent, among other nationalities, I use A bunch of Kalmata olives, and Italian olive oil that looks like Motor Oil! when My Nona ( made me scrambled eggs as a child, she used oil I hated the flavor., but as a Adult, my taste buds sing when I eat a salad, because I think of her. just once I tasted Caviar, I made a run for the bathroom, fish eggs are one of the nastiest things I have EVER EATEN. I live in New England and I love any kind of fish, but fish eggs, Bleck! I don’t think Caviar would be something I would like either Mary!! But the olives…YUM!! That will be my lunch today and I cannot wait to have it! It’s also a perfect lunch for today as it’s going to be hot and humid. So happy to see the quote I submitted! I have this printed and hanging in my office. I read it everyday. I’m in Franklin, TN so we’re practically neighbors! I really like Broccoli Salad. Its simple to make and popular at potlucks too! It has broccoli, cauliflower, shredded cheddar cheese, crumbled cooked bacon, & onion. The sauce has sour cream, mayonnaise, sugar, & salt. It is so delicious! I easily make a small batch or a larger batch without much fuss. If I make it the day before I serve it, I go ahead and cook my bacon but I don’t add it till right before serving. This keeps the bacon crispy instead of soggy. 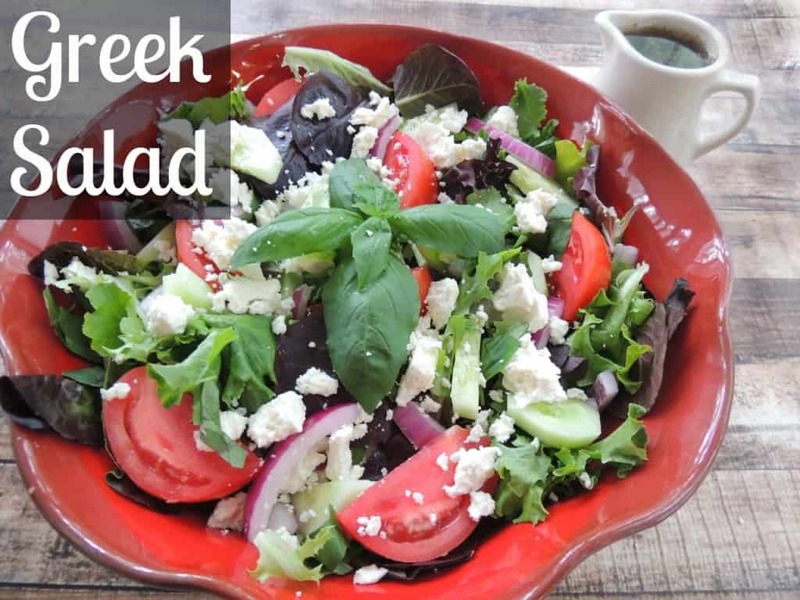 I’m looking forward to trying your Greek Salad very soon!